A middle-aged man from the Brussels region has won a record amount of 168 million euros at EuroMillions superdraw. Two days after the draw of the 11th of October the record winner announced himself to the National Lottery, with the original ticket, the lottery stated on Thursday. It concerns a middle-aged French speaking man, from Brussels, who has been playing at EuroMillions for 10 years. A loyal player: the game runs since 2004. The winner likes thrillers, Robert de Niro films, football, and he is a fish connoisseur, the National Lottery revealed. The winner played in a distribution point in Brussels, ticked his own 5 numbers and 2 stars, and this way managed to become the only winner in the first division during the draw of the 11th of October. 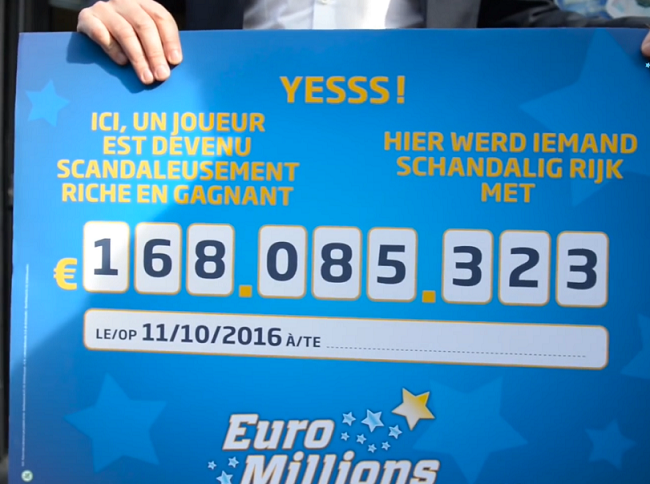 The winner is the largest Belgian EuroMillions-winner ever. The previous record dates from the 9th of February 2007, won by a player from the region Tienen and consisted of 100 million euros. The largest European jackpot consists of 190 million euros. This record is shared by a Portuguese (2014) and a British (2012) winner. With a lotto win of exactly 168.085.323 euro the winner can do many entertaining things. Of course he could buy sport cars, castles, and a private island at his heart’s desire. But what if he would want to be a bit more original than that? You can read our proposals here. However, it would be better if the man would keep his financial business to himself, because Belgians are not particularly sympathetic when won money is concerned, it turns out.